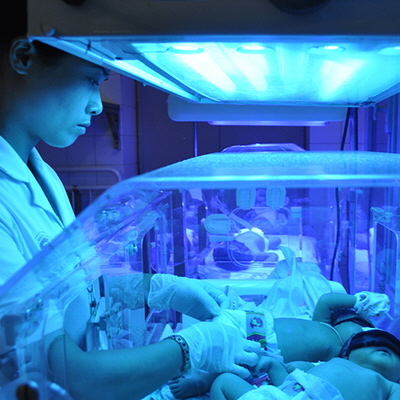 In designing Firefly newborn phototherapy, Design that Matters used human-centered design to transform Vietnamese manufacturing partner, Medical Technology Transfer and Services (MTTS), expanding their impact on newborn health within Southeast Asia and Africa, and positioning their designs to go global. Through multiple meetings with our manufacturing partner in the U.S. and Vietnam, collaborative field research, joint brainstorms, industrial design exercises, and design reviews, Design that Matters planted the seed. The result is an organization that now approaches each new device through a human-centered design lens as evidenced in their new product in progress to prevent newborn hypothermia. The word "design" can evoke images of fashion models and expensive bags. Design is gaining mass appeal as popularized by companies like Apple and IDEO, embodied by everyday products like the iPhone, and celebrated in magazines like Fast Company. Design has also been making inroads into the world of international development and social enterprise. At Design that Matters, we use the power of human-centered design to bring the best technology to the poor in developing countries. When we mention the word "design" to many non-profits and social enterprises, they reply, "I already like the color." Design goes beyond aesthetic. Thinking like a designer means pulling disparate observations and requirements together and using them to inspire yourself to create a harmonious innovation to improve the world. What better place to apply design than in broken markets with too many stakeholders, too few dollars, and so many real needs? 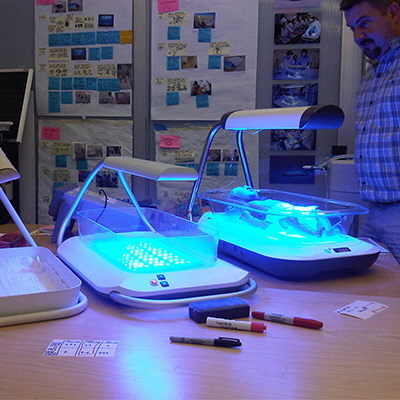 In designing Firefly newborn phototherapy, Design that Matters used human-centered design to transform Vietnamese manufacturing partner, Medical Technology Transfer and Services (MTTS), expanding their impact on newborn health within Southeast Asia and Africa, and positioning their designs to go global. Through multiple meetings with our manufacturing partner in the U.S. and Vietnam, collaborative field research, joint brainstorms, industrial design exercises, and design reviews, Design that Matters planted the seed. MTTS took on a new suite of capabilities from special user interview techniques to rapid prototyping. The result is a Firefly final product that looks identical to the Design that Matters design; a device that has treated newborns with jaundice in 23 developing countries including Vietnam, Myanmar, and Ghana; and an organization that now approaches each new device through a human-centered design lens as evidenced in their new product in progress to treat newborns with respiratory distress. Beginning day one, Design that Matters fostered an open and collaborative atmosphere around the Firefly design process. Human-Centered Design (HCD) is a process and a set of techniques used to create new solutions for the world. Solutions include products, services, environments, organizations, and modes of interaction. 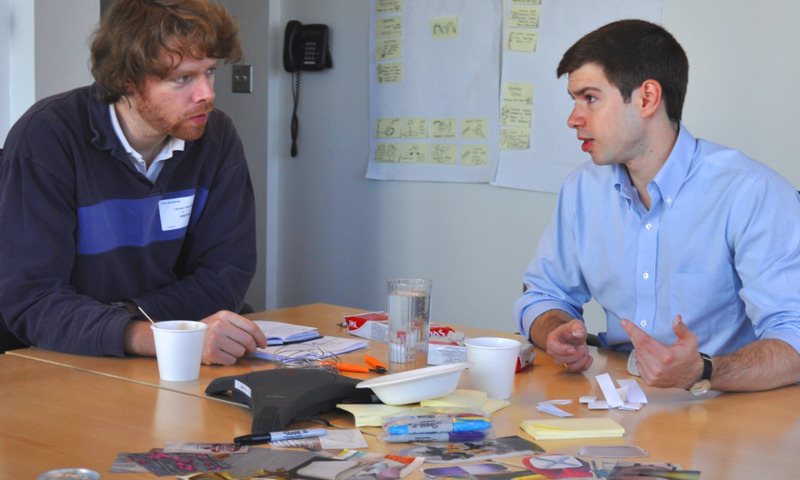 HCD builds on the idea of user-centered design, encouraging designers to use these tools to gain insight from many stakeholders beyond just the end-user. We decided to use the HCD process to better understand the needs of our manufacturer, while simultaneously coaching them to use the process themselves. The staff at manufacturing partner MTTS talk Design that Matters through their Bilibed phototherapy design to help us understand the need, user, and context at the Firefly kick-off in Vietnam. At the Firefly kick-off meeting in Hanoi, the Design that Matters team interviewed MTTS about their deep knowledge about designing medical devices for low resource contexts, and phototherapy in particular. At the time, they had installed hundreds of their custom-designed overhead phototherapy devices and had recently created a new phototherapy prototype called the Bilibed to provide lighting from below. The Design that Matters team broke the Bilibed design into manageable pieces to identify the features where our manufacturing partner knew there was room for improvement. We made each suggestion visual by drawing it on a post-it and sticking it up on the wall. Our manufacturer gained an appreciation for how prototypes like the Bilibed are enormously helpful in fostering deep conversation to guide design. Design that Matters used dual language flashcards to spark better conversations to understand the most desirable phototherapy features. Design that Matters exposed our manufacturer to a variety of stakeholder interview and observation methods including flash cards, drawing, and prototypes to probe beyond what people say they do, to understand what people think and feel. During successive field research visits to hospitals throughout Vietnam, a rotating cast of staff from our manufacturing and implementation partners accompanied Design that Matters, learning many HCD techniques firsthand. In one activity early in the design process, Design that Matters had a set of flashcards listing different product qualities in English and Vietnamese including effective, bright, comforting, and safe for the baby. We invited doctors and nurses to write-in other important qualities we had forgotten, and then asked them to sort the flashcards in order of most important to least important. We then used the flashcards to conduct a discussion through translation about why the qualities were ranked in that order. 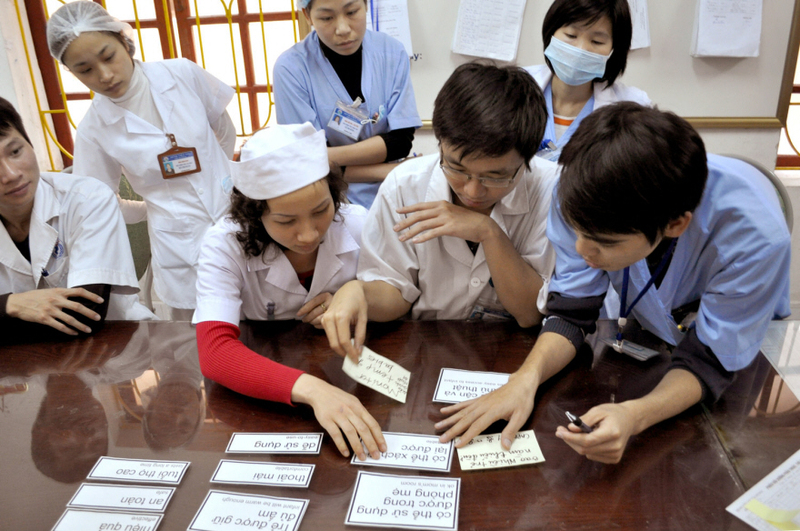 Having dual language flashcards enabled Design that Matters and members of our manufacturing partner team who did not speak Vietnamese to conduct a multi-faceted conversation with healthcare providers without depending solely on the translator. 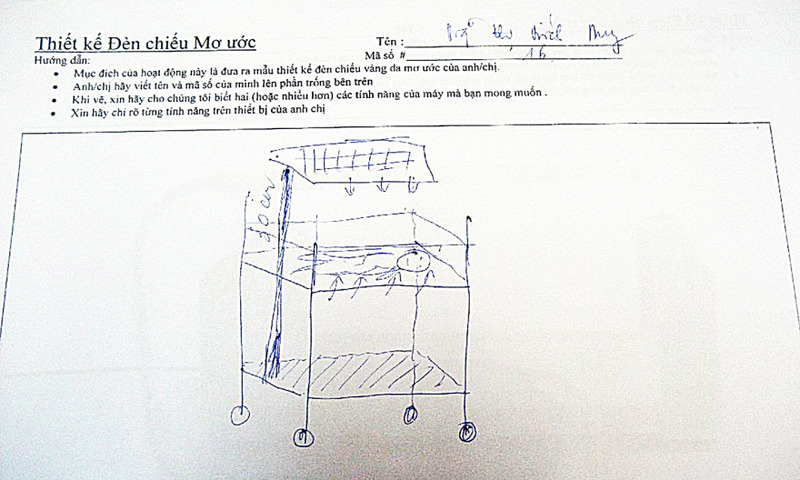 At the East Meets West Foundation Jaundice Conference, a Vietnamese healthcare provider draws their dream phototherapy device with light from the top and bottom. Using the nuanced information we collected early in the field, Design that Matters created concept phototherapy devices and integrated them into photos of hospital settings we had taken during field research. We then coached a team from our manufacturing and implementation partners to independently conduct Firefly concept evaluations at the East Meets West Foundation jaundice conference, bringing together over 80 doctors and nurses in central Vietnam. In one exercise, doctors and nurses were asked to draw their dream device. A lightbulb went on for the team when some healthcare providers drew phototherapy with light from the top and the bottom. Asking users to think visually was a great way to get at what they really need. During a visit to our studio, Design that Matters industrial designer Will Harris coaches our Vietnamese manufacturer through a classic exercise embodying abstract qualities using clay and image collage. We also wanted our manufacturer to understand the role of industrial design in synthesizing so many disparate requirements into a unified form that evokes emotion in the user. During one of our manufacturing team's visits to Boston, our designer, Will Harris, facilitated a classic industrial design exercise. Each team member used magazine images and clay to express abstract concepts like "trustworthy" and "comforting". In this way, the manufacturing team experienced a bit of that magical leap of intuition that leads to an holistic product. 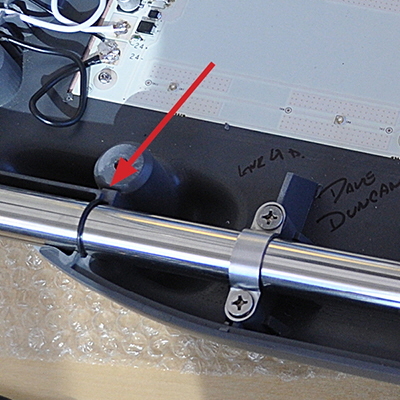 Left: The Design that Matters-made clinical evaluation device. 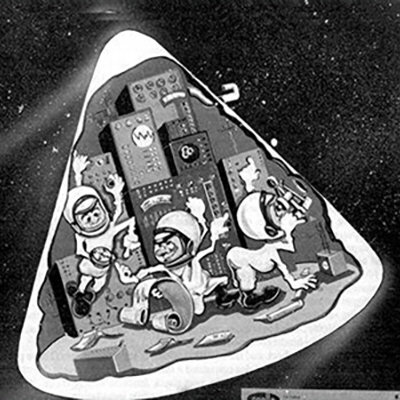 Right: The MTTS-manufactured Firefly device. Right photo courtesy East Meets West Foundation. We knew we had done our job well when we saw the first Firefly fully created by our manufacturer. It looked identical to the four devices we had built for the clinical evaluation in Vietnam. For those less familiar with the typical product design process, the final product often looks quite different from the first generation of test products because the type of information you steep in as a team during the design process is very difficult to convey later to a manufacturer through reports or meetings. The result is that many manufacturers take a design and dramatically alter it to be easier to manufacture. To design Firefly, Design that Matters brought our manufacturer along for every step of the process, creating buy-in, preserving the design intent, and passing on HCD skills that have forever changed their approach to product design. The result is Firefly, a device that MTTS considers to be their flagship product, giving them entry into new countries and rural-level hospitals to save many more babies. MTTS has since hired their own industrial designer and is already using HCD to design new products for infants with respiratory distress and hypothermia.